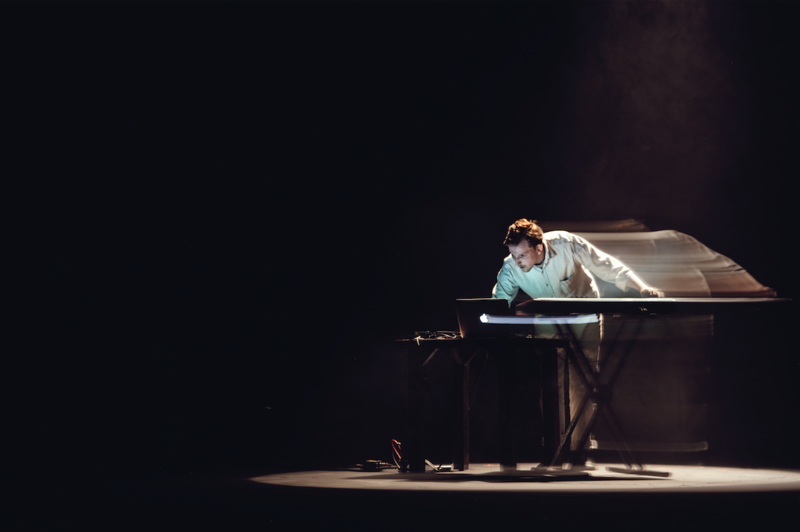 Berlin-based composer Genoël von Lilienstern (b 1979) is working across the fields of instrumental composition, music-theatre and installations, with settings ranging from orchestra pieces with vintage synthesizers, feature-length music theatres to chamber music, solo pieces and installations including robots and drones. His work explores connections between audio-visual collage techniques, social contexts of music and structural processes. Genoël von Lilienstern received numerous prizes and grants, such as the Villa Aurora residency Los Angeles (2017), grant for sound art and composition of Berlin city (2017), Herrenhaus Edenkoben residency (2014), Cité Internationale des Art Paris (2014), Gargonza Arts Award (20012), UdK graduate school grant (2012-2014), Tokyo Wondersite (2011), master stipend of the Ensemble Modern Akademie (2008/09), 1st price Ring.Award.off (2008), 1st price Hanns Eisler competition (2008), Academy of the Arts fellowship Berlin (2006), stipend price of the Darmstädter Ferienkurse (2004). Genoël von Liliensterns compositions have been performed internationally by ensembles such as Ensemble Intercontemporain, Ensemble Modern, SWR Orchester Stuttgart, Stuttgarter Vocalsolisten, Ensemble Adapter and Mivos Quartett. Works commissioned received commissions for festivals such as Münchener Biennale, Ultraschall Festivals Berlin, Attacca Stuttgart, Musik der Jahrhunderte, Eclat-Festival Stuttgart, MARS-Festival L.A., Qubit Festival New York, Tokyo Experimental Festival und Avanti! Festival Helsinki. Furthermore his works have been performed in Cité de la Musique Paris, Casa de la Musica Quito, Matik Matik Bogota, Museo Reina Sofia Madrid and by interpreters such as Ian Pace, Ulrich Mertin, Israel Contemporary Players, Decibel Birmingham, Decoder Ensemble, Ensemble Zaffran, Ensemble Interface, Ensemble Garage, Lucilin Ensemble, Proxima Centauri, Ensemble SIC, Kupkas Piano and phoenix 16. His installations including robots and drones were shown in the Berliner Haus der Kulturen der Welt (HKW) and at Ring. Award Graz. Genoël von Lilienstern studied composition with Younghi Pagh-Paan, Hanspeter Kyburz and Klarenz Barlow in Bremen, Berlin and The Hague. He also studied at the Ensemble Modern Academy and was a Fellow of the UdK graduate school. He was invited as a guest lecturer to Stanford University, California Institute of the Arts, Califonia State University Long Beach, to the Royal Birmingham Conservatoire and gave a masterclass at Novalis festival Zagreb. He was a lecturer for sound design at UdK Berlin and for site-specific composition at Hochschule für Künste Bremen (HfK).